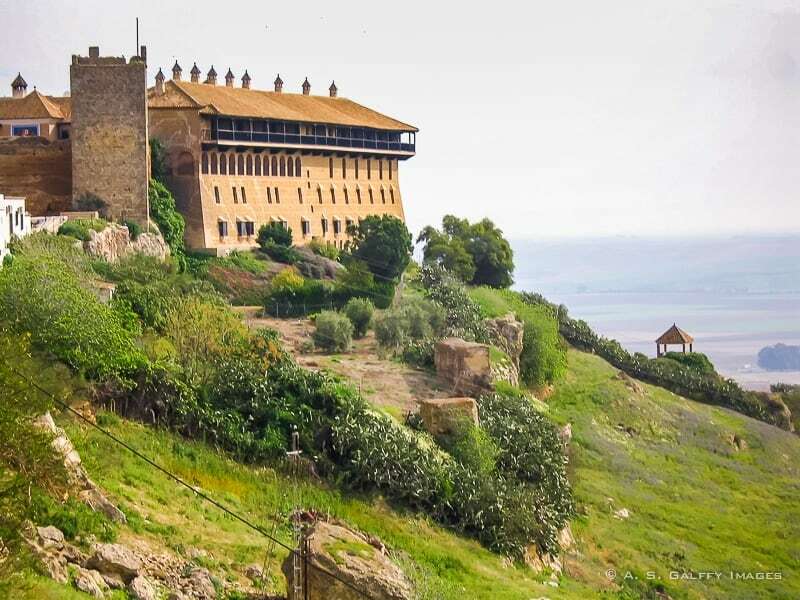 The Parador de Carmona is a 4-star hotel located in a 14th century Arab fortress that dominates the Andalusian landscape, just a short distance from Seville. The magnificent location enjoys the beauty and tranquility of the countryside around the Corbones river. Shortly after driving through its impressive entrance, you realize that this place is like a museum waiting to be discovered. There is charm in every corner and the decor seems to invite you to relax. If you like history and if you ever wondered how would it feel to live in a castle, you will be thrilled to stay in this hotel. If these walls could talk, what a story they would tell! They would speak of the sound of the clashing swords and the blood of the countless men who died in the name of the Cross. They would reveal secrets of the many civilizations that lived here throughout the centuries. If these walls could talk, they would tell stories about the dreams and struggles of so many people. The hotel features a Moorish style patio with a huge fountain in the middle, brick archways with columns and a blue tiled floor. The courtyard is surrounded by pleasant lounges.The halls have beautifully decorated ceilings, and the spacious rooms have balconies overlooking the river and the plains of Seville. The on-site restaurant is one of the most beautiful of all Paradores Restaurants. The dining room is located in the former refectory, a charming room with high vaulted ceilings, wooden beams, and tall windows. There is also an outdoor pool easily accessible down a long flight of stairs, a rooftop terrace where you can watch the sunset and a garden. The historical downtown is just a short 10-minute walk down picturesque cobblestone streets. There you can visit the San Pedro Church and Carmona Necropolis, an excellent archeological site that dates back to Roman times. 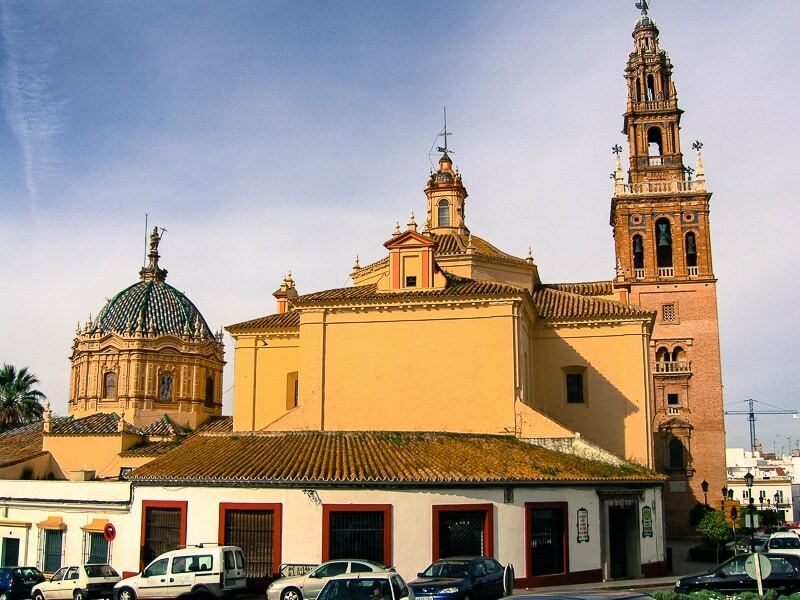 The Parador is approximately 30 km to Seville. 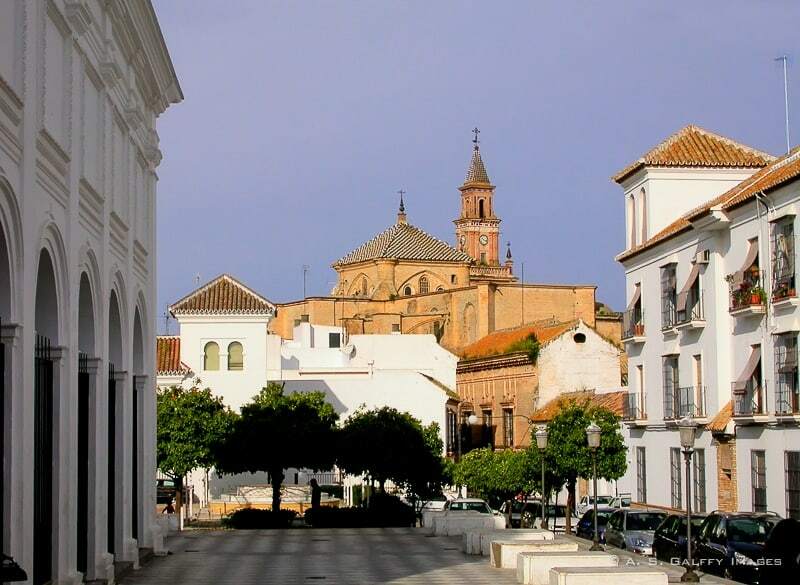 The town of Carmona has a fascinating history and is considered today one of Spain’s National Monuments. We always try to stay in Paradores when in Spain. You really can't beat the value and quality. 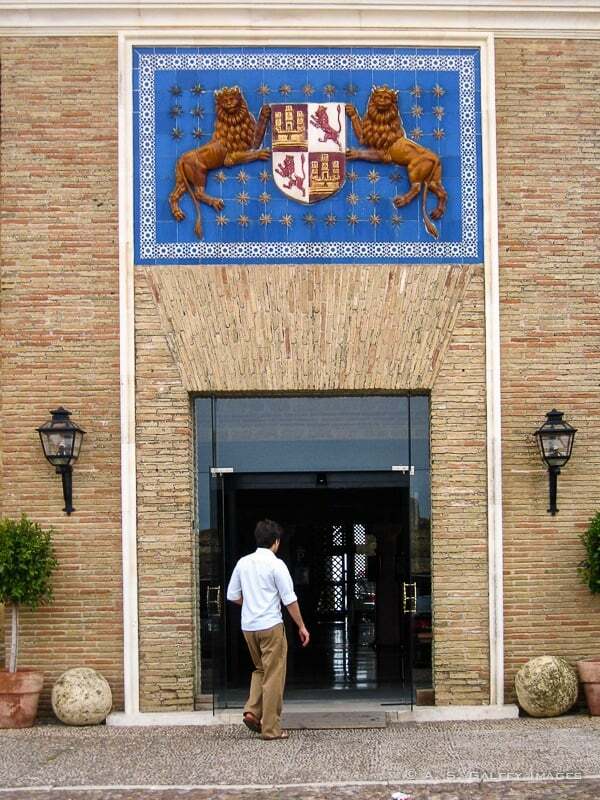 We haven't been to Parador de Carmona but we'll keep it in mind for future visits to the Seville area. Thanks for letting us know about it. Anda, so glad I read this article - it's perfect timing. On our next visit to France we intend to divert to Spain for a bit. We will definately check on availability for staying at Paradores... they sound fab. I had not heard of them before so a big thank you! So glad you'll try to stay at Parador de Carmona. It was a fabulous place to stay, so different from a regular hotel. I'd be curious to see if it changed at all. You are so lucky to have booked into a parador. When I was in Spain, I was too late for the season and no rooms were available for the places I was passing through. When they first appear, about 22 years ago, nobody knew about the Paradores and they were so inexpensive. By the time I went there, the prices were already double, although still cheaper than the hotels. I'm not surprised they are booked these days, especially in summer. I'd love to stay in one of these hotels. I bet they were easier to book in the old days before the Internet. Now I bet it can be hard to get a room. how did you book it? It's been a long time Eileen. At that time indeed there was no internet, so a friend of ours whose husband is Portuguese told us about the Paradores, so we called them directly and booked the room. Oh my this is beautiful! I love the tiles and the archways. I always enjoy staying at a place that has great architecture! Wow what an amazing experience! We've started to really appreciate unique hotel stays - makes the accommodation more of an experience than just a place to rest your head. Putting this one on the bucket list for Spain! Simply stunning! I never knew about Paradores before but they sound absolutely divine. I'm a big fan of unique architecture and turning these beautiful buildings into places to stay, which are being maintained beautifully, is an awesome thing. I had never hear of staying in a Parador before. It seems like an amazing experience. I would love to take my daughters someday. How fun! Looks like such a cool place to stay. I love when old historic spots are turned into hotels like this--makes for an interesting stay!! The style of the property is awesome and those views are amazing! Would love to stay there! You should check the paradors out if you are in Seville, Mark. I never had a chance to stay in this kind of place. How do you find these? Btw, how long will you be in Sevilla for? Might be good to meet up! I'm not going to Sevilla any soon now, Trisha. I'd like to catch up with you somewhere on the road, though. You should try staying in a parador someday, Suze. It's quite an experience and they are very reasonably priced. Looks like you guys had a great time. The hotel looked really nice with nice views. I love staying in historic sites that have been re-purposed as hotels or inns. This isn't the first time I've heard of a castle stay but the building is exquisite and being in such a lovely town makes it very special. Thanks for your comment, Elaine. What makes the Paradores special is that you can get luxury at a very affordable price. What a great place! Thank you for presenting another hidden gem!